Want to save energy and look good doing it? The new Nanoleaf Gem LED light bulb makes going green easy and stylish with its elegant faceted design. Made from shatter-resistant glass, this energy-efficient bulb casts a warm and inviting light that’s literally easy on the eyes with or without a lampshade. We spotted the Nanoleaf Gem in our rounds at the ICFF furniture fair, where the beautiful bulb was displayed alongside the Red Dot Design Award-winning Nanoleaf One and Nanoleaf Bloom bulbs. 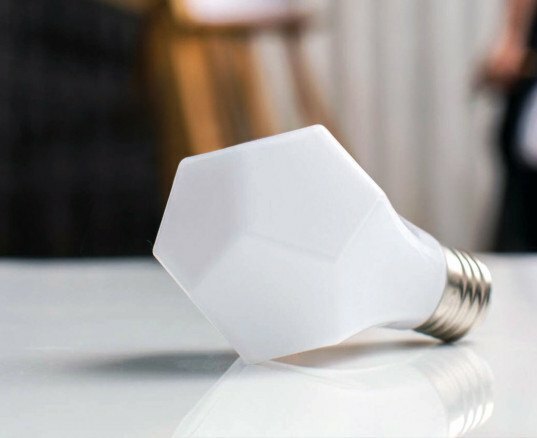 Unlike the rounded conventional lightbulbs, the Nanoleaf bulbs are crafted with striking dodecahedron shapes. The geometric Nanoleaf Gem is sheathed in frosted white glass and casts the same inviting glow as an incandescent. However, incandescent lighting can’t hold a candle to the Nanoleaf Gem’s impressive energy savings—the Gem uses less than eight times the energy of a typical incandescent—and boasts a long lifespan that can last over two decades. The sleek and lightweight Nanoleaf Gem is also the perfect entry Nanoleaf bulb for buyers looking for an elegant LED lightbulb but who are too intimidated by the Gem’s metal-clad predecessors. “The Nanoleaf Gem challenges the industry standards by offering gorgeous glowing light with a statement-making shape and unrivaled energy efficiency,” said Gimmy Chu, CEO and Co-Founder of Nanoleaf. “For the first time ever, an LED bulb offers both elegance and efficiency.” The Nanoleaf Gem retails for USD $24.99. These bulbs are awesome. We will be carrying them at Kouala.co this fall. 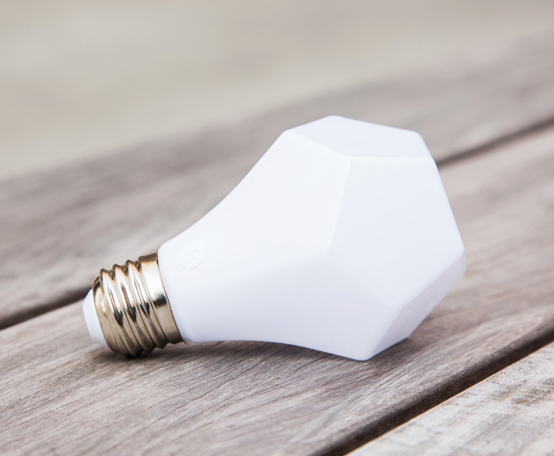 Unlike the rounded conventional lightbulbs, the Nanoleaf bulbs are crafted with striking dodecahedron shapes. The sleek and lightweight Nanoleaf Gem is also the perfect entry Nanoleaf bulb for buyers looking for an elegant LED lightbulb but who are too intimidated by the Gem’s metal-clad predecessors. The Nanoleaf Gem retails for USD $24.99. The geometric Nanoleaf Gem is sheathed in frosted white glass and casts the same inviting glow as an incandescent. Incandescent lighting can’t hold a candle to the Nanoleaf Gem’s impressive energy savings—the Gem uses less than eight times the energy of a typical incandescent—and boasts a long lifespan that can last over two decades. We spotted the Nanoleaf Gem in our rounds at the ICFF furniture fair.